After working with countless people over the years, I still had no clue why it was so hard for people to get ahead. Then, after some deep thought and study, it hit me like a lightning bolt. I had cracked the wealth code. The secret to the economy and how companies and governments basically ran wild without the nasty IRS taking a large piece out of everything they had. Governments, Banks, Insurance Companies; these were the first to pop into my mind. Then all the companies listed on the stock exchange. These entities did not play by the same rules as us. Many did not even pay taxes, even after making billions per year (ie. Amazon $5.7B no 2017 Fed taxes). Also, they were not investing in the Stock Market to create their fortunes. What were they doing that regular people were not? Yes, they had lobbyist and basically owned the government, they employ huge accounting and legal teams; but beyond that, I thought about how they seemed to not have the same restrictions as people do when it comes to money. But why? The idea that changed how I looked at the money game forever was when I realized that the reason they had endless piles of money was that the money they had was not their own. Let that sink in. Really digest that for a moment. While we try and try to build up a pile of cash so we can feel secure, they use Other People’s Money every step of the way. The government takes it, the companies either attract it as investment or as premium. Even better, the more I looked into this forest from the trees idea, I finally got something super important. Not only could you attract a mountain of cash, the tax code is super friendly to using Other People’s Money. So, not only do the organizations have access to massive amounts of resources, they also are not hampered by taxes. For a moment, turn it around. What if every dollar they took from an investor or as a tax, they had to give 30 to 50% away? (Taxes) Our federal government would have to take 40 Trillion just to pay back the 20 Trillion they owe. Or, if corporations had to raise twice the capital just to bring in what they now have? Would they grow half as fast or ever made it to national prominence? Heck, even churches don’t have a tax issue. They can bring in a mountain of cash and do what they will. The television evangelists rake it in like there is no tomorrow, without any tax being levied. Why is this the game changer? Loans buy money, money buys time. How much time can you buy? What if you could buy 30 years or more? What is more risky? Having low chips or high chips. Your business success affords access to money that can be used to greatly enhance your private wealth. This is where the rich leave the rest of the ne'er do wells behind. Time becomes asset instead of a liability. Either go big or go small. In the middle is where people get crushed by taxes. Like standing in wave break, go out into the ocean or stay on the beach. Earning 7 figures and playing game like you’re still middle class will take you back to middle class. Think about it. The nanny state of our nation hates the upper middle class. You must GRADUATE to the next level. The way the financial system creates money is loans. Did you know that less than 3% of “money” is actual currency? With our fractional reserve banking system, banks only keep pennies of your deposit and loan the rest over and over again. They essentially create money “out of thin air”. What if you could partner with the entities that already have the tax advantages we need? How can we be like them and avoid paying the “toll”? That is the question that led me to what I will share with you throughout this Blog. You are already using some of the ideas either in your business or your personal finances. If you have ever taken a loan for a mortgage, raised capital via investors, or something similar, you were using OPM and taxes were non-existent. What is frustrating to me is that it took over two decades to discover. Not two decades in an unrelated business. Two decades in the financial business! If businesses worked the same as personal wealth, probably every large company we can think of would not exist and for sure not at the level we now know them. They would never have enough capital to get off the ground or would be stuck as a tiny fraction of their current self. Between taxes and the lack of capital, they would never get up to flying altitude. After this discovery, I went back and looked at every truly wealthy family, those who could not ever run out of money even if they tried, and guess what? They all had discovered this secret although most had done so without their knowledge. They simply happened on to it and it created an endless wave of cash. The economy loves resources to be utilized. It wants money to move. That’s how the government has something to tax. Is it any wonder why “income” is taxed to death and investment and loans are left alone for the most part? Loans create the “fuel” (money) for the government's taxation machine! How can we use this to our advantage or better, what can we as people do to move from a personal to a corporate economy that has large resources and few obstacles to expansion? There are many possible methods but first and foremost, to move from the slow lane of personal to the jet speed of corporate finance, we have to lose the idea of doing everything alone. In the corporate world, OPM is king. What does this mean, our personal success will create our capacity to attract higher and higher levels of OPM. Next, we must place OPM in places that have guarantees against loss so we do not get in a position of owing money that we don’t have. People that trade investments using margin accounts and then dread a margin call come to mind. Just like a corporation, you want to use OPM in profitable and sure areas to expand your reach. Not gamble the money hoping for a winner. Another area that I and many I have worked with over the years have a problem with is large numbers. It takes big numbers to create big outcomes. If you are thinking small, you will never get big. An easy way to get past this is to think about if you had to retire right now. How much could you draw off and not run out of money? For many, the number is shocking because our brains are not set up to think in decades and millions of dollars. Once you get past this, the rest is straightforward. What is great is that there are huge amounts of money available to assist you in your effort to break free. With the banking industry creating money out of thin air, never before has money been so readily available to put you in a place of certainty like never before. You can do more with OPM than ever on your own. You can create immediate results using OPM. You can greatly decrease time and risk needed to achieve desired results. You can finally live with certainty knowing you have optimum levels of assets. If all OPM did was to remove the tax burden, it would be a miracle to wealth building. Taxes destroy and eliminate not only the funds needed to build, but all of the interest those dollars could have earned. Not to mention the compounding, interest on interest, that is flushed down the drain. Another hidden gem of OPM is that by using others’ money, you essentially take the target off your back so to speak. You remove the personal side of being in the crosshairs of lawsuits and other wealth eating scenarios. What if the government goes haywire and blows up currency like what has happened in many other countries. Would you like to be setting on only your cash left over after tax and lifestyle costs or a pile of yours and OPM? What if inflation is used to pay down government debt? Again, using OPM strategy, your OPM just became way easier to pay down using cheap money to pay back money you put to work. This is a powerful way to transcend wealth classes without having to live in a tent. It is the way of business and now is available to those going up in class. Your success to this point is all you need to prove to lenders your capacity to use OPM. With prudent and insured positions, you can have today what you will not achieve in two lifetimes going the tried and untrue way of on your own. Government debt explodes and taxes go through the roof. On your own, you are a sitting duck. 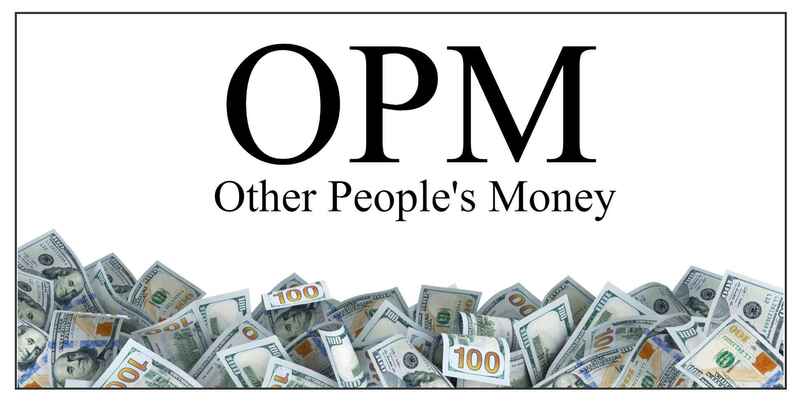 With OPM, you have a fortress that even if inflation goes crazy, your OPM will be paid back with cheap money. Taxes should be a real concern for anyone playing alone, with OPM, they are essentially reduced or eliminated altogether. The government, society, finds it okay to crush the individual but knows it must keep business going to have something to take from the individual. By partnering with banks and insurance companies, you have the two most powerful industries on your side. You get to benefit like a corporation, not get beaten down as an individual. Even the most liberal of society will not cut out those who provide the things they want. Namely cash and jobs. Like going from a sole proprietor to a C Corp, you are transferring risks away from yourself. The banks and insurance companies are assuming the risks, you are paying pennies, while they are “risking” dollars. How cool is that for a change?